Last update January 11, 2003 at 04:30 UTC. The geomagnetic field was quiet to unsettled on January 10. 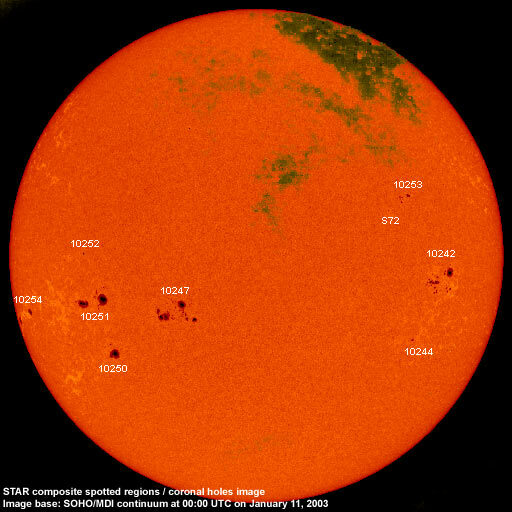 Solar wind speed ranged between 337 and 492 km/sec under the influence of a fairly benign coronal stream. Solar flux measured at 20h UTC on 2.8 GHz was 184.7. The planetary A index was 10 (STAR Ap - based on the mean of three hour interval ap indices: 11.4). Three hour interval K indices: 22223333 (planetary), 322223333 (Boulder). At midnight there were 9 spotted regions on the visible disk, 1 of which has not yet been numbered. Solar flare activity was low. A total of 8 C class events were recorded during the day. A C2.0 event at 14:50 UTC appears to have had its origin behind the southwest limb. Optically uncorrelated flares were recorded at 16:22 (C1.0). 18:11 (C1.7) and 19:05 UTC (C1.2). Region 10242 decayed slowly in most parts of the region, however, a magnetic delta formed in a central penumbra. This central part developed slowly adding spots and penumbral area. The region is clearly the most interesting one of those on the visible disk. An M class flare is possible. Flares: C3.0 at 22:07 and C2.5 at 23:41 UTC. Region 10244 decayed slowly and was mostly quiet. 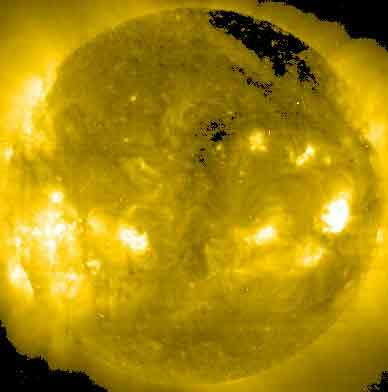 Flare: C1.2 at 03:04 UTC. Region 10247 decayed slowly and quietly. The positive and negative polarity areas, having been narrowly separated over the previous few days, began to drift apart. A minor M class flare is still possible. Region 10250 lost most of the small spots which had emerged one day earlier, the main penumbra was mostly unchanged. Region 10251 added some penumbral area in the trailing penumbra and was otherwise mostly unchanged. An M class flare is possible. Region 10252 developed slowly and quietly. New region 10253 emerged in the northwest quadrant. New region 10254 rotated fully into view at the southeast limb. [S72] A new region emerged late in the day in the northwest quadrant just southeast of region 10253. The region had only a couple of spots at midnight, several new spots are visible early on January 11. Location at midnight: N07W32. 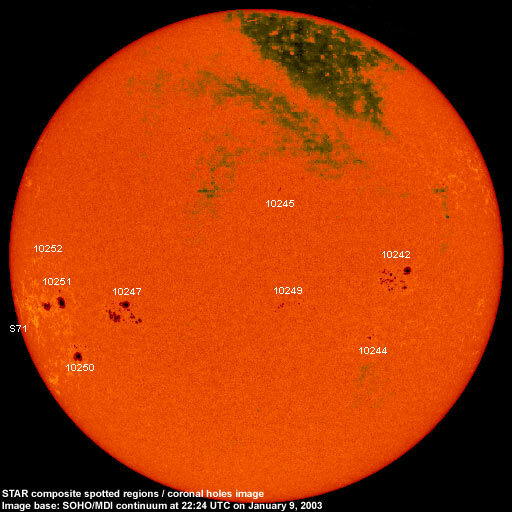 January 8-10: No obviously geoeffective CMEs observed. A small coronal hole in the northern hemisphere may have been in a geoeffective position on January 10 and the associated coronal stream may weakly influence the geomagnetic field on January 13. Processed SOHO EIT 284 image at 01:06 UTC on January 11. Any black areas on the solar disk are likely coronal holes. The geomagnetic field is expected to be quiet to active on January 11 and quiet to unsettled on January 12-14. Long distance medium wave (AM) band propagation along east-west paths over high and upper middle latitudes is fair to poor. Composite image based on a SOHO/MDI continuum image and overlaid by a coronal hole image. Region numbering has been included. Compare to the previous day's image.